In order to keep your reef tank healthy and the inhabitants thriving, you need to keep up with your routine maintenance tasks. Maintaining a reef tank may be more challenging than a traditional freshwater tank because you have more equipment to worry about and reef tank inhabitants may have more specific requirements in terms of water chemistry. Because all aquarium fish and invertebrates are sensitive to drastic changes in water quality and water chemistry, it is best to engage in regular tank maintenance to prevent these drastic changes. 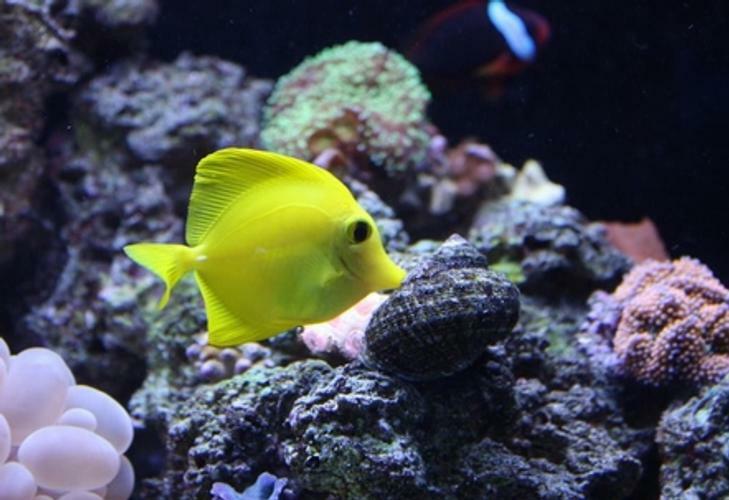 In this article you will find valuable information regarding what type of maintenance tasks are required for a reef tank and how often they should be performed. On a daily basis, you should not only feed your aquarium fish and invertebrates but you should also take a few minutes to observe them. The more familiar you are with your fish and other tank inhabitants, the more quickly you will be able to identify changes in behavior or physical symptoms of disease. You should also observe your tank as a whole, checking to be sure your tank equipment is functioning properly and that the tank temperature is within the desired range. You may also want to establish a feeding routine for your fish to ensure that their nutritional needs are met. Aquarium fish, particularly saltwater fish, may get bored if fed the same bland diet of commercial foods day after day. To prevent this from happening, offer your fish a variety of fresh, frozen and commercial foods. Once a week, you should perform an aquarium water test to check the chemical levels in your tank. The most important levels to check are the salinity and pH of your tank but you should also keep an eye on the water hardness and levels of ammonia, nitrite and nitrate. The easiest way to do this is to invest in an aquarium water test kit so you can quickly test your tank water at home. You may also be able to bring a sample in to your local pet store to have it tested for free, but it is always a good idea to have a test kit at home in case you need it. When performing these weekly maintenance tasks, you may also want to check the water level in your top-off reservoir (if you are using a sump system) and refill it with prepared saltwater if needed. In addition to refilling your top-off reservoir, you should also perform water changes at least twice a month. These water changes do not need to be drastic – in fact, they should not exceed 20% of the tank volume. You must prepare your saltwater at least 24 hours before performing a water change and you should carefully check the salinity to make sure it matches the salinity of the tank. You should also try to match the water temperature so the water change doesn’t have an effect on your tank temperature. In addition to performing water changes, you may also want to wipe down the tank glass and clean away any salt deposits on tank equipment. If you do not test the chemical levels in your tank on a weekly basis, you should definitely do it at least once a month. You will need to test the calcium and magnesium levels of your tank water in addition to the water hardness and levels of phosphates and nitrates. You should also replace your filter media at this time and clean your filter and protein skimmer of salt buildup. You may also want to clean your tank glass and thin out your corals as needed to keep your tank looking its best. Several times a year, you will need to disassemble key pieces of tank equipment to clean them so they continue to run properly. The equipment that may need cleaning includes your protein skimmer, aquarium filter and other additional pieces of tank equipment. Be careful in cleaning your equipment because you do not want to clean all of it at once. If you clean and sterilize too much of your tank at once, you could end up killing off a significant portion of the beneficial bacteria in your tank. As long as you keep your tank in good condition, you shouldn’t have to worry about restocking the tank very often. Some species of reef invertebrate do not live as long as aquarium fish, however, so you may need to restock them once or twice per year. You should also replace your aquarium light bulbs and clean up any calcium or salt build-up from tank equipment. Once a year, you should also replace the membrane in your reverse osmosis machine. Cultivating a thriving reef tank can be a challenge because there is a lot to keep track of. If you are able to establish a maintenance routine, however, you will be able to keep your tank in tip-top shape.